Sonicu consolidates all monitoring, reporting and management functions onto a single, cloud-based platform for virtually all life science applications from cryogenic and ultra-low to gas levels and ambient conditions. Constant monitoring and tiered alarming protect irreplaceable assets. 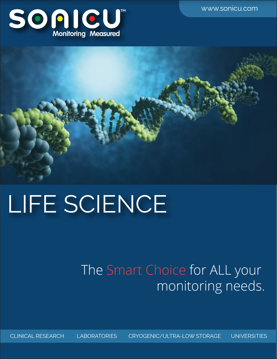 Download our free Life Science brochure to discover how one wireless, cloud-based monitoring platform improves safety, streamlines regulatory compliance and saves time and money for your enterprise.